Denbigh is a busy town that is beautifully located in the dramatic and breathtaking Vale of Clwyd at a strategic point. It has a long and varied history and is a great place to base yourself to explore the likes of stunning Llyn Brenig Reservoir and the Denbigh Moors that surround it. It is also well positioned for enjoying walking in The Clwydian Hills Area of Outstanding Natural Beauty that dramatically fills the skyline easterly above the town. Denbigh always brings to mind warm sunny spring days when I think of it with white fluffy clouds drifting in a blue sky above the aforementioned Clwydian Hills. This is perhaps because on the occasions I have caravanned in the locality it has usually been during April or May and I’ve usually been very lucky with the weather! At one time Denbigh was the County town of Denbighshire and its name (when translated from the Welsh) simply means ‘Little Fortress’ which refers to a stronghold that the Welsh princes held here previous to the castle. The town of Denbigh literally grew up around the castle which dates from 1282 when construction on it began by order of King Edward 1. The site for the fortification was well chosen on a rocky and grassy mound that is elevated above the surrounding land and so was very easy to defend. Edward’s architects may have had some help here as it is highly likely that there were previous forts and structures on the mound that dated back many centuries before construction of the castle took place. It is certain, for instance, that the Welsh had a fortification here as early as the start of the 13th Century. Having defeated and subdued the Welsh people, King Edward 1 set about keeping them from rebelling back against him by undertaking a long series of castle building projects to help him in this matter. Denbigh Castle was one of these and it was given (along with The Lordship) to Henry de Lacy, the Earl of Lincoln who was one of The Kings most successful military leaders. It was de Lacy who, along with master mason James St. George, designed the castle as we see it today. The castle was built in two phases along with over half a mile of town walls. The first phase saw the rapid building of the outer defences principally along the southern and western sides, and it was during this initial period that the town walls came into existence too. The second building phase continued into the 14th Century and saw the majority of the inner buildings being constructed. Between the two building periods the castle was captured during a rebellion led by Madog ap Llywelyn who overran it in November 1294. The castle was recaptured by Edward 1 in December of the same year. The town of Denbigh, although growing up around the castle, had an equally turbulent history and was burnt to the ground in 1400 during the revolt of Owain Glyndwr. It was largely destroyed again during the Wars of The Roses between 1455 -1487 and as a result of this, it moved from the position it had occupied around the castle to be more centred on what is the present town market. During the English Civil War Denbigh was a refuge for a Royalist garrison which surrendered in 1646 after which the castle and walls slowly fell into ruins. Today Denbigh Castle is a popular tourist attraction and is a steep climb from the environs of the town itself. You can wile a good morning away there and marvel at the famous triple towered ‘great gatehouse’ which is often referred to as one of ‘the seven wonders of Wales’. And to extend the day you can explore the line of the old town walls too as a visit to them merely involves borrowing a key from the castle or the town library. A small refundable deposit is required but the views are great although there are a few slippery steep steps and places to be negotiated. There is more to the history of Denbigh than just battle and war and down the centuries it has been an important location for the agricultural trade. As well as this the textile industry became a mainstay of employment in the 1600’s with many specialist weavers, glovers, shoemakers, saddlers, furriers and tanners living and working here. As a mark of the importance Denbigh was held in a Church was begun in 1579 by Robert Dudley the 1st Earl of Leicester and Baron of Denbigh. This Church was planned as a Cathedral and it was intended the title of ‘city’ be transferred from neighbouring St. Asaph to the town. The project was never completed as it simply ran out of money. Modern day Denbigh is a pleasant location to spend time around and has a good selection of independent shops and a modern feel to it. There is a lively arts scene and plenty of pubs, restaurants and cafes where locals and visitors alike rub shoulders. The old town square is a great place to begin your explorations and a pleasant location to simply sit quietly and watch the hustle and bustle of the world go by. There are secret gardens to discover and more listed buildings than any other town in Wales. A day spent exploring the castle followed by a nosey around the streets of the town is time well spent with new surprises appearing around most corners turned. There are two designated Sites of Special Scientific Interest to seek out – Crest Mawr Wood which is adjoining Denbigh Golf Club to the north west of the town and the Tarmac Quarry which is where you will find an endangered and ancient deciduous woodland. Geographically Denbigh is well connected to surrounding areas by the A525, the A543, the B5382 and the B4501. There has been no rail connection to the town since 1962. Denbigh is often viewed as town simply passed through on the way to Ruthin and maybe Wrexham beyond or somewhere glimpsed as you head for St. Asaph and perhaps the coast around Rhyl or Prestatyn further on. This is a shame as the town is well worth at least day of your time – you’ll be surprised as what you find there if you decide to make it your destination next weekend! For the general tourist and lover of history it’s a great place to spend time and for the mountain biker or walker it’s not a bad place to base yourself either – there’s plenty of footpaths, hill country and quiet lanes all around to go and explore to your heart’s content. 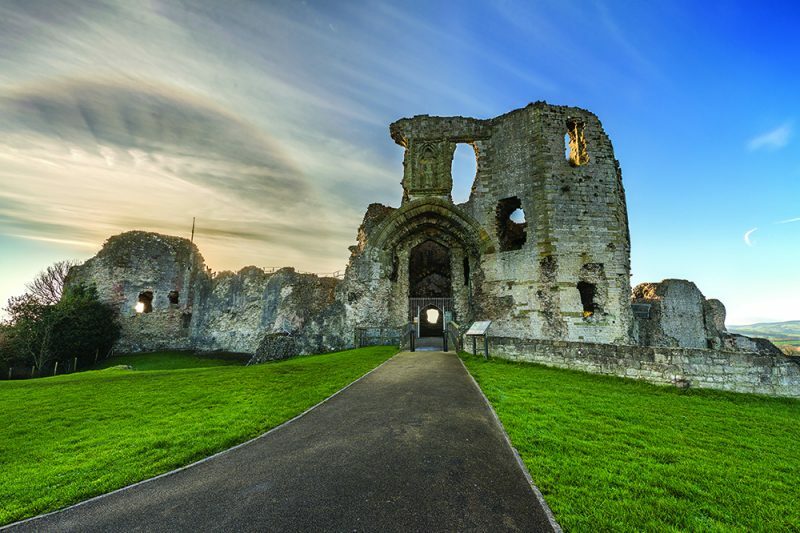 A visit to one of Edward 1st’s dramatically situated Denbigh Castle is a must. Set in an elevated position on a rocky and grassy mound overlooking the lovely Vale of Clwyd, the castle makes a great morning or afternoon out. Although a ruin it is still very impressive and was built in two separate phases with the first being started in 1282 when the external defences were put up. The second phase ran into the 14th Century and saw the construction of a lot of the internal buildings. The castle has a turbulent history and eventually began to fall into ruin after the end of The English Civil War. The town walls can also be visited by borrowing a key from the castle or the town library. A small refundable deposit is required. Llyn Brenig Reservoir is a beautiful location situated amidst the wild Denbigh Moors. It is a short drive from Denbigh and you can make a nice circuit of moorland roads (if you use your road map) to reach the spacious car park and visitor centre near Llyn Brenig reservoir dam. Llyn Brenig is a huge expanse of water set beautifully amidst forest and rolling moorland and is very popular with water sports enthusiasts, trout fishermen, bikers and walkers. Families love to picnic here and follow the good lakeshore paths for strolls with great views. There is a visitor centre with a walk through exhibition, a restaurant with views out over the water, a picnic area and a children’s adventure playground. Choose a nice sunny day to come here. The Cae Dai 50’s museum is a great and nostalgic family day out whether you can remember that decade or not. It is the main source of income for The Cae Dau Trust which was set up in 1992 by Sparrow Harrison to offer temporary accommodation for those in need. The museum burnt down in 2008 but was rebuilt and is a popular day out. It has unique displays that would have been commonplace in the 1950’s and these include sections on sport, music, crime, classic cars and several reconstructed rooms dating from that decade. The museum is set in 25 hectares of grounds on a working farm. Once you have explored the museum you can stroll around the woodland and farmland that surround it. Denbigh Town Council has a group of wonderful volunteers who give guided tours to the public on Saturday and Sunday mornings at 10.30am between April and the end of September. The meeting point is outside Denbigh Library at the top of the High Street. The Wireless in Wales Museum is another unusual and unique attraction you will find in Denbigh. Gwefr Heb Wifrau (Wireless in Wales) is a small popular radio museum owned by the charitable trust of the same name. If you come here you will learn about broadcasting in Wales and the Welsh contribution to the development of wireless technology as we know it today. There are collections of old radio equipment and books along with educational and informative displays. The museum has wheelchair access throughout and is based around the collection of the late David Evan Jones and was opened a few weeks after his death in 2008. The Museum is open on Mondays from 11am to 3pm and on the first Saturday of every month at the same times. Moel Ffamau is the highest mountain in The Clwydian Range (an Area of Outstanding Natural Beauty) of hills and it rises to 1,844ft/562 metres. It is to be found between Ruthin and Mold off the A494 road near to Loggerheads and is visible from Denbigh. The peak lies within The Moel Ffamau Country Park and there are several ways to the top all along good paths and tracks. But there are plenty of other tops to climb as you explore this elevated ridge. The long distance footpath Offa’s Dyke follows the crest of the Clwydian Hills on its long 177 mile/285 km journey from Chepstow in South Wales to Prestatyn in the north. Wear boots and sensible clothing if you come walking here and take along Ordnance Survey Map Explorer 265 The Clwydian Range. The Golden Lion Inn is four miles from Denbigh and nestles beneath the wonderful Clwydian Hills. There are two bed and breakfast rooms for you to book – The Carneddau Room which is the largest and has an en suite Jacuzzi bath and the smaller Clwydian Room which has an en suite with shower. The inn has a cosy bar and the restaurant area serves a traditional pub menu for visitors and guests alike. And on top of this The Golden Lion Inn has its own campsite if you fancy bringing your tent instead. Castle House Bed and Breakfast is located centrally in Denbigh and the old town walls actually form part of the buildings gardens. Accommodation is offered on a bed and breakfast basis and you will find yourself extremely well positioned for exploring the town of Denbigh if you stay here. There are three rooms for you to book – The Gee Room, The Stanley Room and The Dudley Room which is done in a romantic Elizabethan style with a four-poster bed. There is a garden terrace for eating an alfresco breakfast in fine weather. The Guildhall Tavern Hotel is located centrally in Denbigh and offers bed and breakfast accommodation in 11 eleven separate bedrooms. The inn is very historic and is traditionally believed to have been the headquarters of the Parliamentary Generals Mytton and Myddleton during the English Civil War when Denbigh Castle was under siege. Evening meals are available in the bar Monday to Saturday but are not served on Sundays or Bank Holiday Mondays. Meals are from a traditional pub food menu and the tavern is very popular. The Brookhouse Mill is located a short mile drive from Denbigh on the A525. Set in an old and atmospheric mill a traditional pub menu is offered in very pleasant surroundings. The Kinmel Arms is located at Llandyrnog about half way between Ruthin and Denbigh and below the Clwydian Hills. The Kinmel Arms Inn is a lovely country pub serving traditional pub grub in pleasant surroundings. Con Amici is a traditional family owned Italian restaurant located in Denbigh and run by a father and son team. The menu is varied and the restaurant is very popular. The Hope and Anchor Inn dates back to the 16th Century and is located near to the centre of Denbigh and is popular with both visitors and locals alike. A good traditional pub menu is offered. The Glass Onion Café is located on Denbigh High Street and offers traditional café fare ranging from coffee and tea to full meals. Food is home cooked and the café is very popular with locals and tourists alike.